On May 15 Arkansas Native Plant Society will host a field trip to the Moro Big Pine Natural Area located near Hampton, Arkansas in Calhoun County. According to the Arkansas Natural Heritage Commission, the 16,000 acre site is located in an area considered to be the best and largest remaining loblolly pine flatwoods in the Coastal Plain of Arkansas. Plant diversity is high with several rare plant communities represented, including pine flatwoods savanna and woodland, saline soil barrens, and both wooded and open sandy seeps. 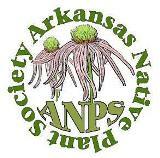 World-class Arkansas botanists, all members of ANPS, will be in attendance to help locate and identify native plants. Plan to meet at 9:30AM at the Exxon station at the intersection of U.S. Highway 167 and U.S. Highway 278 in Hampton. We will then proceed to the field trip site located about 13 miles from the meeting point. Alternatively, participants may drive directly to the field trip site located at “Five Points” intersection within the management area. From Hampton travel south on U.S. Highway 167 to County Road 29 and turn left (East). Proceed 4.4 miles to the “Five Points” intersection. There is plenty of parking at a wildlife check station near the intersection. Participants should bring a sack lunch and waterproof boots.